L-R: Don Randall MBE, Rob Flowerdew E.ON UK, Ruth Nixon Managing Director Zycomm Electronics Ltd and Andrew Nicholls East Midlands CSSC Chairman. The ISL Award was presented to Rob Flowerdew by Don Randall MBE during the CSSC Annual dinner at the Grange hotel in London on the 6th November. 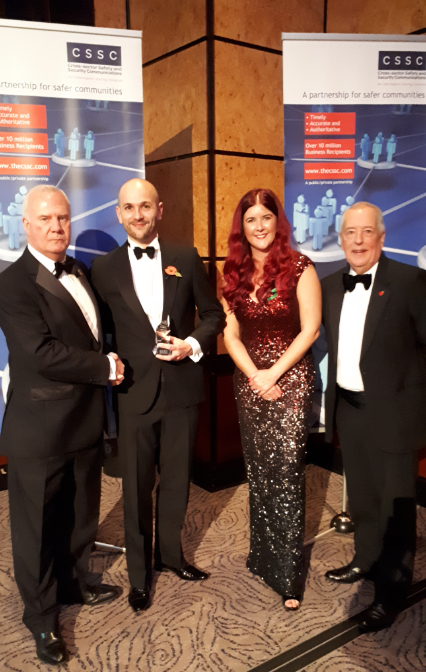 This annual award, sponsored by Two-way radio and CCTV supplier Zycomm Electronics, is the first to be made by the CSSC East Midlands Management Board who established the process to recognise the importance of ISL contributions towards CSSC’s business network. Cross-sector Safety & Security Communications (CSSC) is a voluntary organisation which relies heavily on the commitment made by individual Industry Sector Leads (ISLs). ISLs are the backbone of the CSSC process and it is easy for their dedication to go unrecognised with the majority of work carried out by ISLs being completed outside of their usual working hours. The East Midlands Region of CSSC has been growing rapidly since its formation in December 2017. Chairman Andrew Nicholls says: “Rob’s contribution has had an invaluable effect on raising the profile of CSSC. Involved from the beginning Rob is a great example of how Industry Sector Leads can drive forward the purpose of CSSC. Rob is the Security Risk Specialist for E.ON UK. He is responsible for the identification and management of security risks and threats to E.ON’s UK businesses and supports emergency and crisis response.